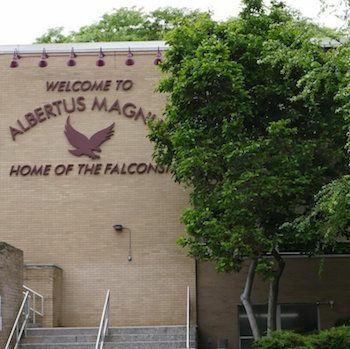 Albertus Magnus is a co-educational college-preparatory high school operating within the tradition of the Sparkill Dominican Sisters. Our holistic approach stresses, intellectual, spiritual, moral, physical and emotional excellence of the whole person. Students are encouraged to live the four pillars of the Dominican tradition of Prayer, Study, Community, and Service. Education encompasses more than the acquisition of knowledge; it also demands the training of the intellect. Our curriculum exposes students not only to their strengths, but also to courses and areas that will challenge them. Albertus Magnus offers Advanced Placement, College Level, and Honors courses which are intended to provide additional challenges within the standard areas of the curriculum. Some students may opt to take seven classes after freshman year, allowing more elective opportunities; however, this would require foregoing the traditional lunch period within the schedule. Students and parents should carefully read the course descriptions that follow. Once courses have been selected, it is not possible to change classes (an exception will be made during the first quarter only for students who find an honors course(s) too difficult for them, or a teacher recommends the change). Course changes after schedules have been finalized may result in changes to other classes. Any student interested in taking more advanced courses must obtain Department approval. Applicants will be provisionally accepted based on grades through the first semester; however, such acceptance is contingent upon the final grade at the end of the academic school year. Students not accepted at the time of course selection will have the opportunity to reapply at the end of the academic school year if the final grade meets the course prerequisite and if there is room in the class.